We have got new diving quality equipment in the rental. 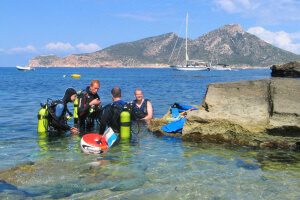 You can hire it only for one dive or as well for your whole holiday. It is also possible to rent only individual items of equipment. The equipment is existing in all common sizes. Extra equipment like computer, torches, NIKON photo camera or GoPro video camera are also available with selfie stick. When the equipment is returned, each item is hygienically cleaned, disinfected and controlled.